Companies Who Start With Implementation Are At Risk. In a frantic hurry to catch up with customers, companies often jump into social media without having a plan, which is a classic “leap before you look” approach. Soon, they find they are unable to scale as more customer adopt the tools, and are not ready for a long term engagement with customers even around negative conversations. While companies feel compelled join the conversation now to respond to customers, they should not throw out business planning. 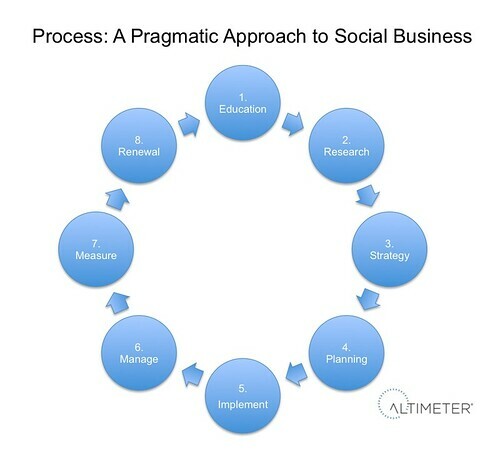 To avoid this predicament companies should step back and approach social business like any other business program: with a plan. Instead, Follow A Pragmatic Process. Start with gaining intelligence, by first getting educated about how business is changed, then develop a plan that aligns with the needed resources. While many of these phases are an ongoing effort, and have overlap to each other, this process is a designed to help corporations who don’t know where to start to use as a checklist. Education, Research, Measurement should be ongoing efforts across the entire program, but in order to get started this pragmatic set of steps are an ideal way to start. This process described below isn’t a new one, it’s a classic pattern found by most seasoned program and project managers, but I’ve added specific ‘social business’ questions to assist. 5) Implementation Initiating the plan How will this be integrated into existing efforts? Community managers, developers, agency partners, technology vendors. 8 Renewal Improving the effort after understanding how it has been deployed How can we improve this effort going forward? How can we integrate it? All teams, but most importantly expand beyond the social team into the rest of digital marketing, events, and real world experiences. *Caveat: Many of these items such as education, research, and measurement should not be started then abandoned, but instead are an ongoing part of the overall program. To get started, print this post out and use as a checklist for each of your social business initiatives: communities, blogs, Facebook pages, and beyond. Ensure that your strategy and plan has each of these elements in line as well as answers the resources required for each. In our recent webinar in Getting Your Company Ready for Social Business we discuss the importance of having a plan.